In the first feature, the people of Troy must make a monthly delivery of one maiden to a nasty sea monster that will otherwise destroy the city in lieu of payment. Some citizens decide to relocate, only to be captured by pirates. Hercules (Gordon Scott) feels this whole situation could use a little improvin’ so he steps in to help out. Also starring Gordon Mitchell (from Little Rita and Atlas In The Land Of the Cyclops as seen on The DVOPD), Roger Browne (from War Of The Robots), and Diana Hyland, it’s Enzo Barboni’s 1965 epic Hercules And The Princess Of Troy. The second feature is a television adaptation of George Orwell’s story of a futuristic society that practices mind control, constant widespread surveillance, and ovesees all aspects of all citizens daily life – 1984. A production of the Westinghouse Studio One program in 1953, it features an all-star cast including Eddie Albert, Lorne Greene, and Robert Culp. 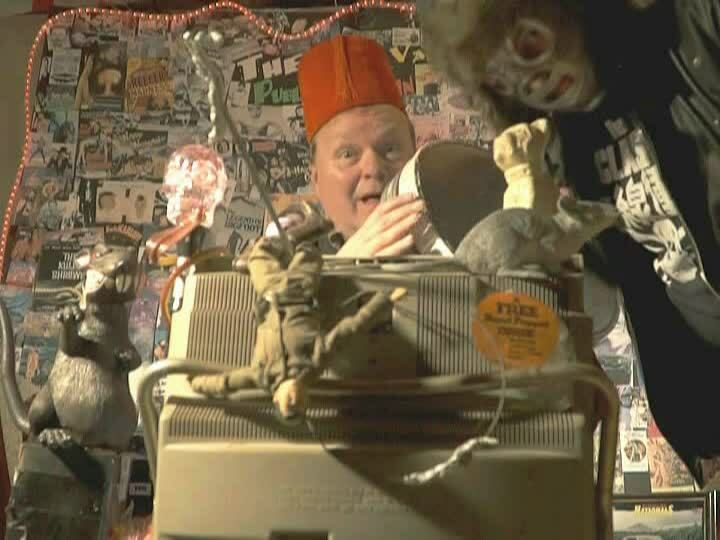 While UNCLE PETE sorts things out in front of the Dark Vault View Screen, he manages to dig up a clothing ad featuring Moe, Larry, and Curly Joe and a trailer for a big screen version of 1984 (from 1984). Plus, we hope you have good toes in your sandals cuz we’re all gonna Tip-toe Through The Tulips during a musical interlude from the one and only ukelele playin’ Tiny Tim. ~ by UNCLE PETE on May 13, 2016.